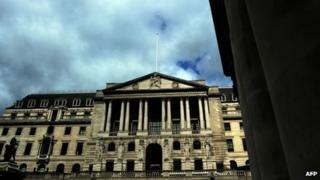 Two members of the Bank of England's Monetary Policy Committee (MPC) voted to raise interest rates in August, the first time in three years that policymakers have done so. The minutes of the meeting on 6-7 August show Ian McCafferty and Martin Weale voted for a 0.25% rise to 0.75%. It means the nine-member MPC voted 7-2 to hold interest rates at their historic low of 0.5%. The pound jumped in expectation that rates may rise sooner than expected. Sterling rose 0.20% against the US dollar to $1.66. If follows official data on Tuesday which showed inflation fell to 1.6% in July. It is the first time there has been a split on the MPC since July 2011. Interest rates have been unchanged since March 2009. The minutes came a week after the Bank of England published its quarterly inflation report in which it halved its forecast for average wage growth, saying it now expects average salaries to rise by 1.25% this year. Data from the Office for National Statistics (ONS) also showed average wages excluding bonuses grew by just 0.6% in the year to June. That was the slowest pace of growth since records began in 2001. However, the Bank upgraded its growth forecast for this year to 3.5% from 3.4%, and for 2015 it forecast growth of 3%, up from 2.9%. The MPC minutes showed that despite low wage growth both Mr Weale and Mr McCafferty felt that rapidly falling unemployment made it more likely that salaries would pick up in the coming months. Both members made the argument that wages may not rise until spare capacity in the labour market was fully used up. But they also suggested an early interest rate rise was desirable as a way of anticipating inflationary pressures from wage rises. The two members argued that recent robust economic growth had been underpinned by "stimulatory monetary policy" and that a rise of 0.25% would mean monetary policy remained "extremely supportive" given that before the 2008 financial crisis "normal" interest rates had been around 5% on average. Bank Governor Mark Carney has said that any rise in interest rates would be gradual. Interest rates have been kept at the ultra low level of 0.5% since 2009 in an attempt to bolster the economy. But for months now economists have been going through the minutes of the MPC with a fine tooth comb and examining almost every economic statistic for any hints as to when rates will rise. So, two of the nine members of the MPC voting to increase rates is a massive clue for economists. That matters not just for the millions of people with savings accounts, mortgages or other debts; it will also influence the rate of economic growth, the profitability of firms, the strength of the pound and the value of shares. Which is why the subject is arousing so much comment and analysis. City analysts said despite the split on the MPC, Tuesday's inflation figures showed the Bank remained under no immediate pressure to raise interest rates. Peter Hemington, partner at BDO, said: "There are still big question marks for businesses on when the rise might come. Businesses cannot plan for growth on the basis of vague or conflicting statements - policymakers can do more to provide certainty for businesses, enabling them to make informed decisions for the future." David Kern, chief economist at the British Chambers of Commerce, said it was "disappointing" that two members had voted increase rates. "With inflation well below target and wage growth stagnating, any increase in interest rates at the moment would be premature," he said. "The economic recovery is still not secure and growth amongst UK businesses must be fostered in a low interest rate environment. The risks from raising rates too early are much greater than the risks of waiting just a little longer," he said. Laith Khalaf, senior analyst at Hargreaves Lansdown described calls for an interest rate rise premature adding: "The last time the committee vote split was in July 2011, shortly before the eurozone crisis kicked interest rate rises into the long grass. Yesterday's inflation data and continuing anaemic wage growth may also put somewhat of a dampener on the enthusiasm for rate rises."